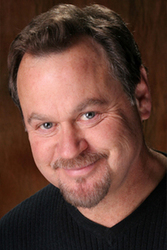 GREGG BERGER continues to combine his on camera, stage work, writing, teaching and his convention personal appearances, nationally and internationally, with his consistently busy voice over career. In addition to his 80's Transformers work as the voice of GRIMLOCK, LONG HAUL, SKYFIRE and OUTBACK, he was also the animated voice of SPIRIT, FIREFLY, CUTTER and RIPCORD on the original G.I. Joe animated series. In January of 2001, Animation Magazine named Gregg as one of their "Top Voice Actors of the New Generation." As an animation voice-over talent, it's been a dog's life for him and that's just the way he likes it. He has been the voice of ODIE the dog on Garfield (since Odie has had a voice) as well as numerous other cartoon characters, such as evil-doers KRAVEN the Hunter and MYSTERIO on Fox's Spiderman and AGENT K in Men In Black on the Kids' WB, just to name a few. Interactive Game credits include work for Ensemble Studios, Lucas Arts, Disney Interactive, Dreamworks Interactive, Electronic Arts, Naughty Dog, Sierra, Westwood and others. His game titles include Fall of Cybertron as GRIMLOCK, Rise of the Dark Spark as GRIMLOCK and LOCKDOWN, Transformers: Devastation as GRIMLOCK and LONG HAUL, HALO Wars as CUTTER, Spiderman: Web of Shadows as KINGPIN, Wolverine: X-Men Origins as FRED DUKES aka THE BLOB, Final Fantasy X and X-2 as SIR JECHT, Kingdom Hearts as EEYORE, Star Wars: Episode One Racer and Star Wars: Phantom Menace, Winnie the Pooh/Eeyore Interactives, Curse of Monkey Island, Small Soldiers, Baldaur's Gate, Gabriel Knight, Ground Control, Red Alert, Wacky Racers, Tarzan, Ahhh!!! Real Monsters, and more. His voice can also regularly be found on radio and television commercials, network promos, feature film trailers and radio recreations. What does Gregg Berger enjoy doing most? Simple... "all of it!" Gregg has also volunteered his time and talents to Los Angeles based Famous Fone Friends, and through them, have made calls to kids in Pediatric Hospitals all across the country. Gregg Berger remains grateful as always for his fans' continued SUPPORT!